Any golfer will tell you there’s always room for improvement no matter how long you’ve been playing the game. That’s golf! 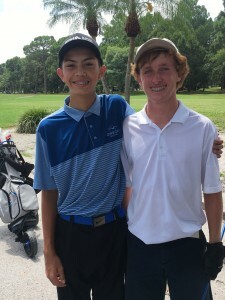 And Bill Shriver and Pat McClanan Shriver, lead instructors at The Golf Academy at the Cove Cay Golf Club, offer fun and innovative instructional programs to golfers of all skill levels. Whether you’d like to learn to play the game, or enhance your skills and lower your handicap, Bill and Pat would love the opportunity to teach you. Both Bill and Pat are Award Winning PGA Class A Teaching Professionals who have been teaching golf for the past 20 years. Pat is the only woman to have won the prestigious North Florida PGA Section Teacher of the YEAR award, and Bill has won the North Florida PGA Section PLAYER of the YEAR award. Bill has also won TEACHER of the YEAR for the West Central Chapter of the North Florida PGA. With the skills of Pat & Bill, it’s a winning combination. The Golf Academy instructors work with beginner golfers as well as advance players ages 5 and up. For advanced players, your lesson/lessons can be customized to focus on a specific skill that you’d like to improve upon. For example, if your putting has been giving you fits simply tell your instructor you’d like an hour dedicated to putting.